Understanding the very early stages of embryo development is of interest because this knowledge may help explain why a significant number of human pregnancies fail at this time. Once a mammalian egg has been fertilised by a sperm, it divides multiple times to generate a small, free-floating ball of stem cells. The particular stem cells that will eventually make the future body, the embryonic stem cells (ESCs) cluster together inside the embryo towards one end: this stage of development is known as the blastocyst. The other two types of stem cell in the blastocyst are the extra-embryonic trophoblast stem cells (TSCs), which will form the placenta, and primitive endoderm stem cells that will form the so-called yolk sac, ensuring that the foetus’s organs develop properly and providing essential nutrients. Previous attempts to grow embryo-like structures using only ESCs have had limited success. This is because early embryo development requires the different types of cell to coordinate closely with each other. However, in a study published today in the journal Science, Cambridge researchers describe how, using a combination of genetically-modified mouse ESCs and TSCs, together with a 3D scaffold known as an extracellular matrix, they were able to grow a structure capable of assembling itself and whose development and architecture very closely resembled the natural embryo. Professor Zernicka-Goetz and colleagues found a remarkable degree of communication between the two types of stem cell: in a sense, the cells are telling each other where in the embryo to place themselves. 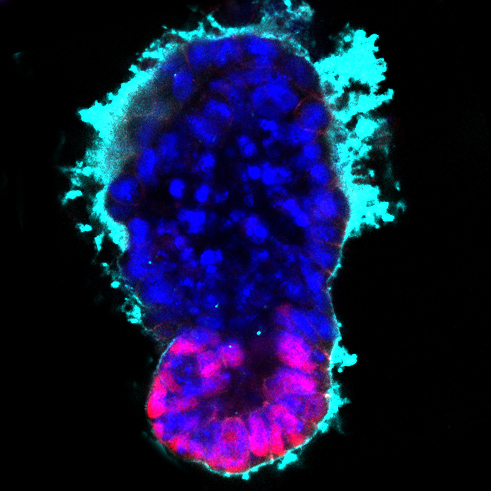 Comparing their artificial ‘embryo’ to a normally-developing embryo, the team was able to show that its development followed the same pattern of development. The stem cells organise themselves, with ESCs at one end and TSCs at the other. A cavity opens then up within each cluster before joining together, eventually to become the large, so-called pro-amniotic cavity in which the embryo will develop. While this artificial embryo closely resembles the real thing, it is unlikely that it would develop further into a healthy foetus, say the researchers. To do so, it would likely need the third form of stem cell, which would allow the development of the yolk sac, which provides nourishment for the embryo and within which a network of blood vessel develops. In addition, the system has not been optimised for the correct development of the placenta. Professor Zernicka-Goetz recently developed a technique that allows blastocysts to develop in vitro beyond the implantation stage, enabling researchers to analyse for the first time key stages of human embryo development up to 13 days after fertilisation. She believes that this latest development could help them overcome one of the main barriers to human embryo research: a shortage of embryos. Currently, embryos are developed from eggs donated through IVF clinics. The research was largely funded by the Wellcome Trust and the European Research Council.